The Angriest: Doctor Who: "The Pandorica Opens"
It is 19 June 2010, and time for another episode of Doctor Who. A message bounces from person to person through time and space until it finally reaches the Doctor (Matt Smith), and directs him to AD 102 England where he discovers River Song (Alex Kingston), Stonehenge, and the Pandorica - a fabled prison for the most dangerous criminal in the universe. As showrunner of Doctor Who, Steven Moffat clearly had a different attitude to story arcs than his predecessor Russell T Davies. For Davies it was largely sufficient to develop a buzzword or catchphrase ("bad wolf", "Torchwood", "Mr Saxon") and then lead the audience along until the meaning of the phrase was used in the season finale. With Season 5 Moffat took a much more active approach. The crack in Amy Pond's (Karen Gillen) bedroom wall, the growing silence falling across the universe, the revelation that the TARDIS will explode in the future, and the teasing of the mysterious Pandorica by River Song back in "Flesh and Stone" all come together in one two-part finale - not to mention cameo appearances in the cold open by Vincent Van Gogh, Elizabeth X and Winston Churchill. I'm honestly not sure any season climax has previously felt so deliberately climactic. The episode does a marvellous job of constantly upping the ante. The pre-credits sequence is a whirlwind of guest appearances all leading up to one striking image: a Van Gogh painting of the TARDIS exploding. From there it's a quick jump to ancient Britain, the discovery of a massive alien cube hidden underneath Stonehenge, then the arrival of pretty much every major Doctor Who monster in history, the discovery of presumed-dead Rory Williams (Arthur Darvill) alive and well and living as a Roman Centurion, the countdown to the Pandorica opening and revealing its occupant and then the shock discovery that it is empty. It was built to contain the Doctor by all of his foes combined, and is intended to stop his TARDIS from exploding and destroying the universe. The attempt fails anyway: the TARDIS explodes with River inside, the Doctor is sealed inside the Pandorica, Rory turns out to be an Auton duplicate and Amy gets mortally wounded when he shoots her in the chest. And then the universe ends. Blimey. The whole of Season 5 has expressed Doctor Who as a time-travelling fairy tale, and that storytelling style feels particularly emphasized here. River even notes that she hates fairy stories, because the kindly wizard always turns out to be the Doctor. Midway through the episode the TARDIS takes River to Amy's childhood home, where it becomes clear that her memories have been copied to create the entire trap: the Romans, Stonehenge, and even Rory's apparent resurrection. The scene brings a perfectly execution 'drop of the guts' moment, as the situation goes from tense to catastrophic in the space of a conversation. Not only is the series generally pushing fairy tale themes, it makes its climactic set-up an actual child's fantasy. A highlight for Matt Smith is the Doctor's defiant speech to the circling starships above Stonehenge. It's the perfect blend of humour and gravitas, and one of the most defining moments of his three-season run. It's also undercut beautifully: the speech over, the aliens forced to back off, the Doctor's only comment is that he's bought himself another thirty minutes to resolve the situation. The image of so many Doctor Who enemies assembled together is a child's viewing fantasy, with Daleks, Cybermen, Sontaran, Judoon and Autons all lined up together to defeat the Doctor once and for all. Early scenes involving half-destroyed Cybermen attacking the Doctor and Amy are the best use of the Cybermen in quite literally decades. 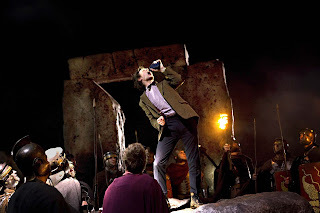 For a two-part finale, "The Pandorica Opens" is one hell of a first half. It really does end on such a monumental cliffhanger that it is hard to imagine how the Doctor can ever win the day. 12 episodes into Season 5, and 11 have been good. This one was great. The quality ratio rises to 92 per cent.